What is the Crossover Diet? The Crossover Diet is almost like it sounds, crossing over to a healthier diet from where you are now. It is the median between a diet of foods that are detrimental to your health and a diet of foods that will nourish your body and promote good health. 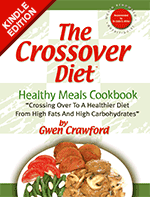 The Crossover Diet is a conduit between a healthy and an unhealthy diet. It is a diet that cushions the transition from a lifelong habit of eating foods high in fat, salt and sugar to a diet of eating foods low in fat, salt and sugar. Dr. Llaila O. Afrika, world-renowned nutritionist and naturopath, stated that the Crossover Diet is a step in the right direction on the road to an optimal healthy diet (www.drafrika.com). Dr. Afrika has researched the relationship between what you eat and how it affects your overall health. He has lectured on this topic all over the U.S. and abroad. He advocates that we should be consuming at least 85% of our foods raw and that we should use whole grains, and eat more vegetables, sprouts and fruits. He explained that when foods are cooked, the heat kills the enzymes that assist in the digestion of foods. That is why enzymes are known as the life force and/or energy of food. He believes that a healthy diet is a must to obtain a healthy body, but he also realizes that it takes time to change bad eating habits and crossover to a healthy diet. The Healthy Meals Cookbook contains recipes and preparation techniques that support the Crossover Diet. When we cook with our health and the health of our love ones in mind, we truly cook with love. This cookbook offers recipes that provide a healthy alternative for preparing foods. There are suggestions on healthy alternative products and helpful hints listed under the Tips for Healthy Cooking section. Getting started on the “Crossover Diet” is not as difficult as you may think. Before you start, Dr. Afrika recommends that you take the herbs Cravevex or Craveless to reduce your craving for sugar and salt. STEP #1 - Eliminate when possible or greatly reduce the five whites from your diet – white flour, white sugar, white salt, white rice and white potatoes. STEP #2 - If you eat meat, reduce your intake to 3-6 oz. a day. Select one or two days a week that you don’t eat any meat at all. There are many good meat-free ideas in the Meatless section of the Healthy Meals Cookbook. STEP #3 - When possible, buy organic fruits and vegetables because they are grown without harmful chemicals and pesticides. Add some raw fruits and vegetables to your diet every day. STEP #4 - Make a grocery list of herbs and spices and alternative products you need to start your Crossover Diet. (See Tips for Healthy Cooking) Make a meal plan for the week (see the bonus menu section of the Healthy Meals Cookbook) so you can purchase the items necessary to prepare the meals you have selected. Do not eat after a set time (a time you have set yourself) in the evening. It should be a few hours before you go to bed. STEP #5 - Most nutritionists stress the importance of drinking plenty of water. It is suggested that you should drink at least 8 to16 ounces of water before breakfast – bottled or purified – not tap water. You can also replace many of your beverages with water. Put turkey in a mixing bowl and add Worcestershire sauce, herb blend, salt and garlic powder. Mix well with fork. Add onion, green pepper, milk, egg and catsup and mix thoroughly. Spray skillet with oil spray and heat on low heat setting. Scoop heaping tablespoons of turkey mixture into skillet. (Mixture will be soft.) Shape into balls while cooking - 1 1/2 to 2 inch meatballs. Cook for approximately 15 minutes or until meatballs are brown on all sides. Pour in 1 cup of your favorite barbecue sauce and simmer for an additional 15 minutes. The best way to reduce shopping and preparation time is to plan meals early. No matter what meal you prepare, it is always best to plan it completely before shopping; that way you will not arrive home to discover you have forgotten something crucial. Buy items that are on sale or that you use frequently in larger quantities, separate, and store accordingly. Make sure you allow for the necessary time and temperature differences between microwaves and conventional ovens. Most recipes will not require too much of an adjustment. You will find that you can use less oil by cooking with a lower heat setting, thus reducing fat. I recommend removing all possible fat from meat, poultry, and fish. To do so, when meat or poultry is cooked, chill liquid in freezer briefly or cool until fat rises to the top, then remove. Cook with stainless steel, glass or Pyrex cookware. These products do not emit chemicals or particles into the food. Do not use a microwave for recipes that need long cooking times. It is said that microwave cooking takes the nutritional value from food.